Annie Rhodes ’14 had her first study abroad experience at age eight—in a village elementary school in Ancient Corinth when her family moved to Greece. While she remembers being apprehensive in a classroom where she could not speak or understand the language, she said she quickly made friends, learned passing Greek, and discovered a passion for travel and language. 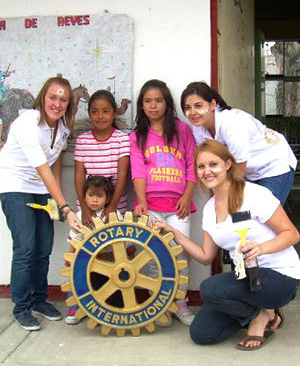 By the time she came to Notre Dame in 2010, the North Carolina native had spent several years and many summers in Greece, as well as a year in Guanajuato, Mexico through the Rotary International Youth Exchange Program. Rhodes, who majored in sociology and French, is now a graduate student in the combined B.A./M.A. program in French and Francophone studies. 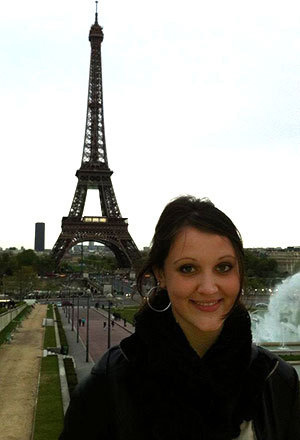 She spent her sophomore year studying abroad in Angers, France and returned to France her senior year to conduct research at the Bibliothèque Nationale de France in Paris. “Annie Rhodes is a brilliant student who brings spontaneous energy to the study of literature and film in French. Not only is she an outstanding and committed scholar, but she is also a delightful individual,” said Alison Rice, associate professor of French. Center for the Study of Languages and Cultures (CSLC): What are your plans for the future? Rhodes: I am participating in the five-year B.A./M.A. program in French, so I am on campus for one more year getting my master’s degree. I am very excited to have the opportunity to continue working with the exceptional faculty and students in the French program at Notre Dame. My fellowship requires that I also teach a beginning French class to undergraduates, which I’m thrilled about—I have some experience teaching language to little kids, but this is the first time I’ve had a classroom full of academically ambitious people close to my own age, and it is a rewarding challenge. After obtaining my M.A., I’d like to take a year or two to teach or work in a Francophone or Hispanophone country before beginning a Ph.D. program in either French or cultural anthropology (for which my background in French language and culture will be vital). I am also toying with the idea of going to school to become a translator. CSLC: What has been your favorite part of learning a language at Notre Dame? Rhodes: I love my professors, who are unbelievably supportive but also push and challenge me. I find myself constantly inspired and humbled by them. In all my classes, I see timid people being encouraged by the professors to speak up, and we are all made to feel that our insight is valuable. And the French faculty is full of smart, strong, enthusiastic female scholars: exemplary role models for female students. My professors are accessible and always ready to advise me on academic or even personal matters. Many graciously invite their classes to dinners, movies, and into their homes. They also consistently afford us exceptional opportunities to engage with great people from outside of Notre Dame. I have been able to attend talks by and have intimate meals with influential Francophone filmmakers, social commentators, and authors. In a class I took with Professor Julia Douthwaite, we were introduced to and had an extended discussion over lunch with Elaine Sciolino, the Paris correspondent for the New York Times. I also love being able to access some of the world’s greatest literature and films in their original language. I have come to realize that translation—while being an amazing human feat and immensely important—often inadvertently adulterates meaning. Especially in literature, in which the art is language, it is very difficult for nothing to be lost when the words themselves—the very paint on the canvas—are changed. But perhaps the most rewarding part of language learning is also the most obvious: communication. Most people who know me would say that I love to talk. And I love to understand other people. I believe that you get to know someone on a much deeper level if you are capable of communicating with them in their native language, and, better yet, in multiple languages: speaking different languages allows people to express different parts of themselves. CSLC: What mentors have you had at Notre Dame? Rhodes: I have been encouraged and inspired by every professor I’ve had in the French program, but I would say that Alison Rice is my main mentor. I had a class with her every semester for two years, and she is my go-to for advice and support. She inspires me because she is a smart, driven scholar who is at the same time completely devoted to her family. I think she’s got life figured out: she seems as happy and fulfilled as anyone I’ve ever met. Professor Julia Douthwaite has been an important mentor for me, as well, although I’ve only taken one class with her. In my senior year, Professor Douthwaite guided me through the process of conceiving a research project, obtaining a Nanovic Grant, conducting research in Paris, and putting together a finished project. She even met with me while I was in Paris. She, too, is a wonderful scholar, an excellent teacher, and a very strong woman, and I value her advice deeply. Finally, Professor Odette Menyard, the director of the Angers program, has figured very importantly into my ND career. Before I went to Angers, she was one who pushed me to make the decision to study abroad for an entire year. And then, in France, she was there for everything: she took me through the confusing bureaucratic processes with the French government and the school, she counseled me on personal matters, she gave me academic help whenever I sought it, and she was our advocate. CSLC: How do you use your languages—here or abroad? Rhodes: I’ve had lots of opportunities to speak French in the past few years. Of course, I speak French in all my classes, and I spent my sophomore year speaking French all the time in Angers—with my host mother, French friends and acquaintances, and professors. It was wonderful to go back to speaking French full-time during a research trip to Paris in my senior year. When I’m out with fellow graduate students as a group, we always speak in French. And, I still talk and text in French with the two other Notre Dame students who stayed the entire year in Angers when I was there, partly out of nostalgia for that year, but mostly out of our common love for the language. I actually use French a lot in situations outside Notre Dame, as well. At random events like wine-tastings and art openings, I meet French people, French teachers, and people who have studied French. At the farmer’s market in my hometown, there is a French vendor. So every Saturday when I’m home, I walk down there just to talk to him. I also use Spanish all the time, because there are so many Spanish speakers around and because I have tons of Spanish-speaking friends. I taught Spanish two summers ago at a language academy, and I tutor children in Spanish and French now. CSLC: How would you describe your Notre Dame Study Abroad experience? Rhodes: When I arrived in Angers, I was picked up by my host mother—a remarkable 83-year-old woman named Madame Herisseau. Despite the language barrier, I immediately felt comfortable with and affectionate toward her. There could have been no better way to make me feel welcome than the freshly cut flowers from the garden she had waiting for me in a vase in the bedroom and a handmade quiche and mousse au chocolat in the kitchen. The first month, we had intensive French language courses every day, and we had culture courses a couple of times a week. The schedule was pretty demanding, but it was worth it. We all made tremendous progress during that month. From October to June, I took language classes and electives each semester—including a course at the local university intended for native French students. It was a very important experience, for it was in this class, where I was held to the same standards as the French students, that I became confident in my academic French. We went on multiple excursions as a group during the year, including one to the Christmas markets in Strasbourg, and one to Brussels for a private tour of the EU headquarters. I also took advantage of cultural events—constantly going to museums, concerts, festivals, plays, and expositions. I was never bored in France, and these shared experiences with my host mom contributed to the special bond I formed with her. CSLC: Was there a particularly memorable experience? What did you learn from it? Rhodes: When I was in France, I went to a cooking class with three other ND students. It was stressful because we couldn’t really understand what was going on and we were trying to pay attention to the teacher and cook three courses at once. We were embarrassed and sure we were being judged, but we were wrong. People were so nice. Several ended up coming over and helping us out—bringing us ingredients, repeating the instructions to us more slowly, and giving us advice on stirring, whisking, and chopping. We were so grateful! At the end, as we were all eating together, an older couple came over to tell us how much they appreciated our presence and invited us all over the next week to their home for a private cooking lesson. We got to meet their family and spend a lovely evening with them. We stayed until 1 a.m. just sitting around and talking. This kind of experience was repeated a number of times in France, and it taught me that even the smallest, seemingly insignificant act—attending a cooking class one Saturday night instead of hanging out with other Americans, for example—can inspire someone to reach out to you. And when you’re living in a foreign country, someone reaching out to you is just about the best thing that can happen. When you’re abroad you should never refuse an invitation or pass up on an opportunity to do something new. CSLC: What advice would you give to anyone learning a language? Rhodes: Don’t be afraid to make mistakes! Your thoughts are important, and you can find a way to express them, even when you’re just starting to learn a language. You don’t have to speak perfectly to warrant being heard. Originally published by Matt Getze at al.nd.edu on November 14, 2014.